The Plot: Franny Banks moved to New York to become a famous actress and she gave herself 3 year to make it before moving on and doing something else. Said deadline is just six months away but she still hasn't landed more than a small part on a regional comercial that barely ran at all. In the midst of auditions and call backs, acting classes and a waitressing job that barely pays the bills, she spends her time with her best friend Jane (who wants to be a movie producer) and Dan, the aspiring writing they took in as roomate. Franny is really struggling with her deadline, with what to do with her sort-of-long-distant relationship with her college boyfriend Clark and her attraction to a fellow student in her acting class. Is she making the right choices? will she be a struggling actress for life? First Date: Okay, Franny I'll play along. Sometimes you're really funny but others you just can't seem to hold my attention. I like the 90's references though, and I even like Dan and Jane. Second Date: I'm not sure I want to hear so much about auditions and call backs and that whole process, I don't care that much about it. Also I'm not liking this James character, I have seen his type before, I know where this is going. Third Date: Well, that was a little abrupt wasn't it? The ending felt a little like an non-ending and it wrapped things a little to neatly for me. but it was a fun story. Relationship Status: Don't call me, I'll call you.... maybe. 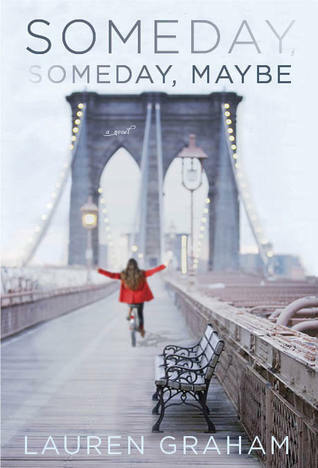 Okay, here is the thing about Someday, Someday, Maybe, it has it moments of great charm but it also has some stuff I just didn't care about. I liked Franny for the most part, she was very believable as an struggling actress. I liked her friends and her voice was funny. But it took me a while to warm up to the story and really care about what was going on, and the pace of the story was a bit uneven. On one hand, I totes love Lauren Graham, and I can see a lot of her in the writing - mostly in the humor - but on the other hand, it wasn't a really stellar book for me. It was okay, fluffy, fun (though sometimes I lost my patience with Franny and her choices) but no more than that. PSA: Don't You Forget About Kat!! !